Dr. Peacock absolutely 100% no argument should have been played by Jeffrey Combs. Yes, it would have been sucking up to genre fans, but it would have been SO PERFECT. I mean, I get that it's Baal, but still. Wow, the show went a little bit serious just to show that they can. Wow, the actress who plays Kelly is really good. Buuuuut...this was basically just that one episode of Buffy, and felt like filler. I bet there are going to be some very good Ash-with-Ashy-Slashy-puppet cosplayers at cons now. How does this compare to Buffy's Season 6 episode "Normal Again"? I haven't seen that Buffy episode, but this is a (pretty good) take on the standard thing whether either the hero is crazy and has been in an asylum and imagined all of this or an evil force is making it look like that to break him. YMMV, of course, and again, I haven't seen the Buffy thing. But this is a pretty standard trope. See, for example, much of the last ten years of the Moon Knight comic book. Buuuuut...this was basically just that one episode of Buffy, and felt like filler. 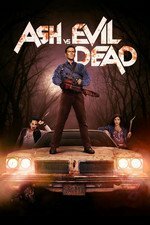 Considering that they're already renewed for season 3 and Campbell has said he'd like the show to go 5 seasons, I think this is turning into more of a horror-trope-anthology series than the more straightforwardly extended Evil Dead movie that was season 1. I think I'm ok with that though. I'm not a huge horror buff, so it's interesting to see which episodes work for me and which are too much. Yeah, I think Campbell makes the obvious-horror-trope work here. The puppet play, in particular, was great. It's interesting that the last three episodes have been, basically, in a box. This one entirely in the asylum, and particularly in just a couple of rooms; the previous episode in the house; in the police station before that. Focusing the action in a single location probably lets them stretch the budget a bit further while at the same time making everything seem more desperate.